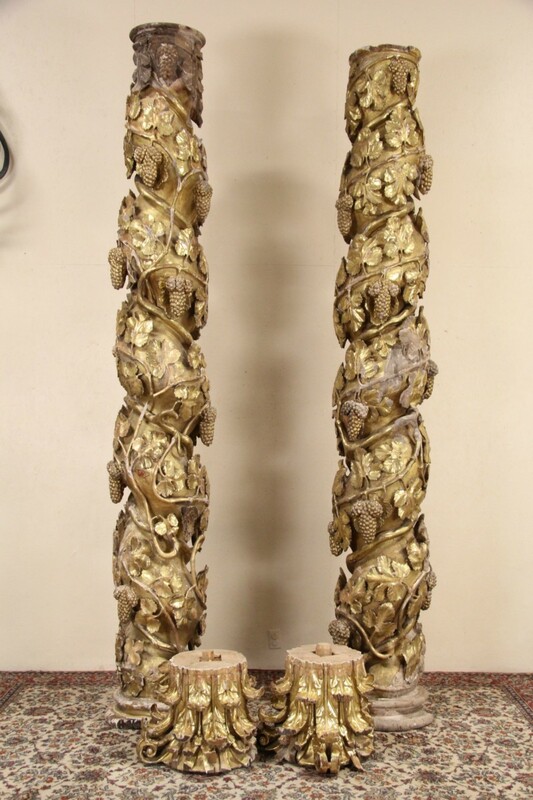 An incredible pair of Italian Baroque columns are architectural salvage from the late 1600's or early 1700's. Hand carved with grapevines in a spiral pattern, three dimensional artistry is remarkable. These antiques are reminiscent of Bernini's columns over the altar at St. Peter's in Rome. The well worn finish is burnished genuine gold leaf with touchups over the centuries. There are lots of losses as shown plus a box of pieces. No attempt has been made at restoration of these heroic antiques. Capitals are separate, they would need carpentry to be securely attached, some pieces are in the box. Hand hewn, the wormy wood is hollowed out on the back side where they were originally attached. This historic pair was brought from Italy decades ago for a project that did not materialize. Open wooden crates for shipping are included. More pieces are loose on these fragile European fragments. Size is about 21" diameter and 11' 2" long plus 17" capitals, or about 12 1/2' overall.